The 2017 Global Risks Report comes at a critical moment for the world as we know it. Unprecedented forces are reshaping society, economics, politics and our planet itself in ways some might not have predicted when the first risks report was launched a decade ago. The most pressing of these risks relates to our environment. Even though the risk will play out over the long term, actions have to be immediate and long-lasting to have any hope of reversing the trajectory of climate change. 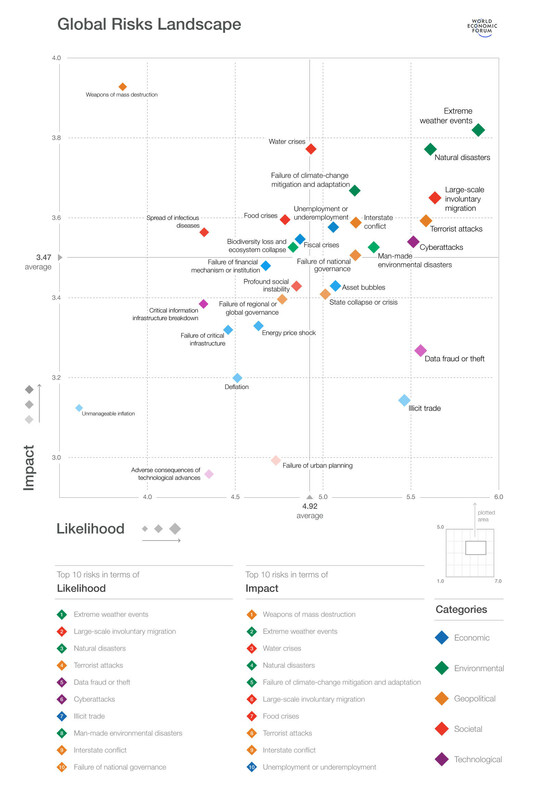 The environment dominates the 2017 global risk landscape in terms of impact and likelihood, with extreme weather events, large natural disasters as well as failure of mitigation and adaptation to climate change as the most prominent global risks. Climate change ranks as one of the top three trends to shape global developments over the next 10 years, and remains one of the truly existential risks to our world. Unlike the threat of nuclear weapons or pandemic disease, however, climate change ranks among the highest in terms of likelihood as well as impact. Here, cooperation is fundamental to any response to the challenges faced from climate change, from managing “global commons” such as oceans and our atmosphere to enacting international accords like The Paris Agreement and statements that emerged from COP 22. Further progress was made during 2016 in addressing climate and other environmental risks. The pace of change, however, is not fast enough. Beyond the state of the planet we inhabit, socio-economic considerations have also been high on the collective agenda over the past 12 months, and will continue in importance throughout 2017. These include rising income inequality and the polarization of our society along ethnic, religious and cultural lines. This coming-together of circumstance contributed to profound political change in 2016, and has the potential to exacerbate global risks in 2017. Beyond geopolitics, social protection systems have suffered from a “perfect storm” of threats since the 2008 financial crisis – and we expect this trend to continue through 2017. Underfunded state social systems, the rise in “non-traditional” employment models from gig economies to zero-hour contracts, prolonged periods of low interest rates that increases the burden of saving for retirement, and demographic pressures like ageing populations and mass migration all place great strain on social protection systems. This means a larger share of the cost and risks for the individual, which can inhibit business growth and harm economies. We need social protection options that are flexible enough to adapt to new realities in 2017 and beyond. The best social protection solutions will be highly interconnected. Collaboration among state, business and the individual will be crucial. Fail to act and we risk threatening government finances and increasing social unrest. Technology, in particular, may be where we can turn for innovative solutions to today’s risks and challenges. It may also produce additional risks which must be assessed and factored in to thinking at business, government, and international levels. 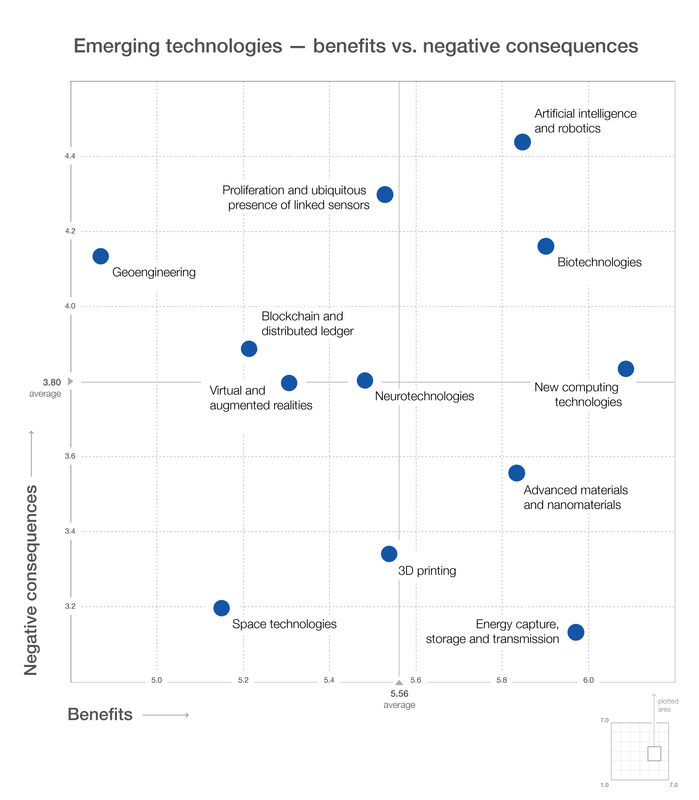 New and sometimes revolutionary structures such as Artificial Intelligence systems represent such opportunities for streamlining our everyday lives, but also bring with them many potential dangers. These include mismanagement, design vulnerabilities, accidents, unforeseen occurrences and malicious use that post risks to security and safety of individuals. Furthermore, disruption to labour markets will intensify as jobs seen traditionally as falling under the “skilled labour” category are replaced by machines. The subsequent unemployment or underemployment exacerbates social instability. Cyber-attacks, software glitches – and even heavy cloud and solar storms – can all have damaging impacts on our new infrastructure, which in 2017 can cover fields as diverse as transport, energy, communications, and water. Finally, we must consider how best to respond to these challenges. Across all five sectors that the Global Risks Report covers this year, we must work together and stand as one as we face up to the global risks of the coming year. Individual responses on topics like climate change, globalization and regulation of the “4th Industrial Revolution” can only achieve so much. In an increasingly interconnected world, it’s clear that collaboration between different countries, sectors and societies will be more important for managing risk than ever before. For companies, responding to global risks will require a truly holistic risk management approach taking inter-dependencies between risks into account.